Hilton HHonors has now launched its Summer Weekends sale for 2015 that is valid for stays May 22 – September 27, 2015. Between July 24 – August 31 some hotels will also offer midweek availability. The discount is up to 35% off of the Best Available Rate. The regular discount is up to 30% off but Hilton HHonors members get an additional 5% off at select hotels. When I was looking for hotels in London for this coming weekend, these Summer Weekend Sale prices were the lowest (although the weather is currently terrible here). This tends to be one of the better sales of the year and coincides during the European summer vacation months when business hotels have soft occupancy rates. Offer is subject to availability at participating hotels within the Hilton Worldwide portfolio of brands in the UK, Europe, Middle East & Africa. Offer available for stays booked between May 19, 2015 and August 23, 2015 and completed on weekends between May 22, 2015 and September 27, 2015, except as indicated below. For purposes of this offer, “weekend” is defined in Europe as Friday, Saturday and/or Sunday nights and in Middle East & Africa as Thursday, Friday and/or Saturday nights. Must book a minimum 3 days before arrival. Rates are non-refundable and full prepayment is required at time of booking. Your credit card will be charged immediately for the total amount quoted for the entire stay as reserved and refunds or credits will not be issued unless otherwise indicated by local law. 10% refund applies to hotels in Germany only. Charges cannot be applied to other stays, services or merchandise. Booking cannot be changed. If you fail to arrive at the hotel on the scheduled arrival date, your reservation will be cancelled and you will not receive any refund or credit. Rates featured in advertising are the lowest rates available for destinations, not at specific properties. Participating Waldorf Astoria™ Hotels & Resorts, Conrad® Hotels & Resorts, DoubleTree by Hilton™, Hilton Hotels & Resorts, and Hilton Garden Inn™ hotels are offering up to 30% discount (which varies by participating hotel) on the Best Available (easy cancellation) Rate and the Best Available Bed and Breakfast rates. Participating Hampton by Hilton™ properties are offering a 15% discount on the Best Available Rate. Some hotels may extend discountson midweek arrival dates from 24 July 2015 to 31 August 2015. Some hotels may offer discount on premium room categories only (i.e. Executive or Deluxe rooms) and rates advertised may be for premium room categories. Some participating hotels may offer a discount off of the Dinner, Bed and Breakfast Best Available Rate. For participating hotels located in the Middle East & Africa and Turkey: Between 19 May and 18 June 2015. For participating hotels located in continental Europe: Between 19 June and 20 July 2015. For participating hotels located in the UK and Ireland: Between 21 July and 23 August 2015. 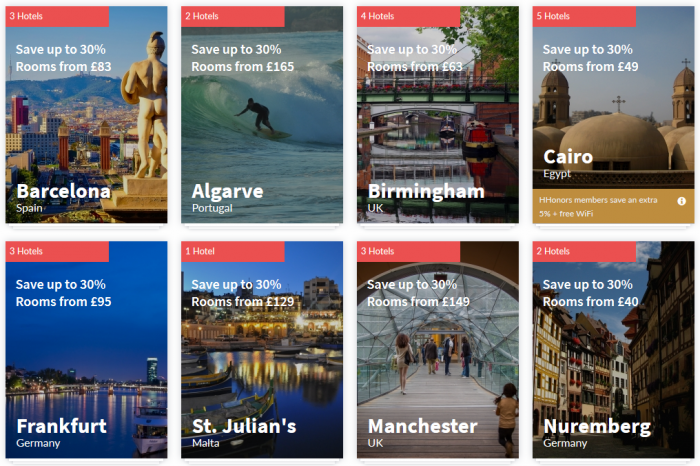 Must book plan code PR08HO, PR08HB or 8HB for Hampton by Hilton hotels. If you are not enrolled as a valid Hilton HHonors member at the time of your arrival, your stay will be ineligible even if you booked the “Hilton HHonors” discount rate. Standard wifi is included for Hilton HHonors members who book this rate for the duration of the stay and is limited to three devices per room.